Schach DVD A repertoire against the Sicilian | Videolektionen | Eröffnung | Training | ChessBase | Schachversand Huber - Spielen Sie eine Partie Schach ! 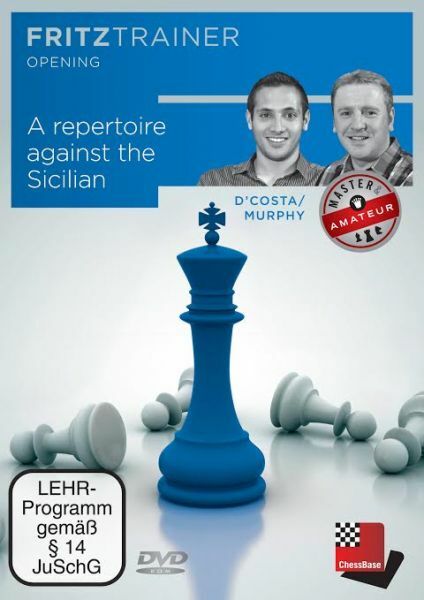 Produktinformationen "Schach DVD A repertoire against the Sicilian"
For years the only correct way to play against the Sicilian was to tackle it head-on with the Open Sicilian (i.e. when white plays an early d4). However, the amount of theory required is colossal and not to everyone’s taste. In recent years, some of the worlds best players have started to essay some dangerous anti Sicilian lines, with great success. New ideas have been found which immediately put black on the back-foot, without the need to learn reams of theory. In this Master & Amateur DVD, International Master Lorin D’Costa and chess software expert Nick Murphy outline the various “anti-Sicilians”. These openings can give you a potential advantage, whilst avoiding your opponent’s favourite Sicilian line. Kundenbewertungen für "Schach DVD A repertoire against the Sicilian"